We know how it is: you’re chilling in your Genghis Khan-esque tent, or perhaps on your hot tub boat, but you’re thirsty. Why the hell don’t you have a mobile, full-service bar at your disposal? Well, someone must’ve had the same thought, because now you can get an Apollo 70. 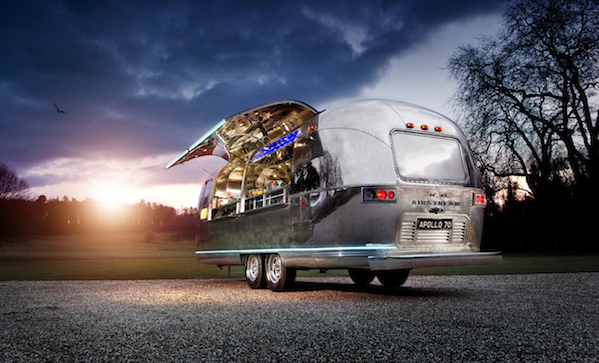 It’s an Airstream that contains top-shelf booze, TVs, LEDs, and a gleaming bar surface. They also have a kitchen, in case you get hungry. Sadly, this gift of the gods is based in the UK. They’ll travel to you, if you have the coin; alternatively, you could steal this business idea and have your own mobile bar. Provided that Canada’s crotchety old man government lets you. Which it almost certainly wouldn’t. That’s it; we’re moving to Chicago.